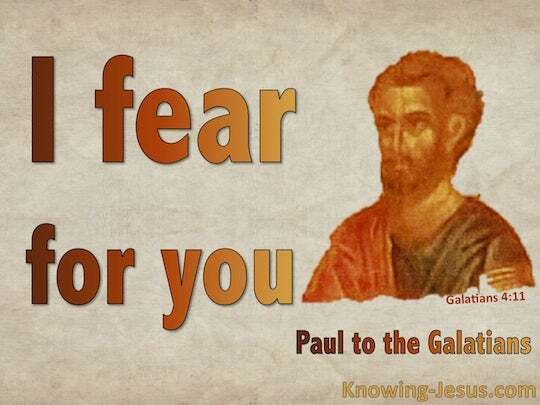 ﻿ Galatians 4:11 I fear for you, that perhaps I have labored over you in vain. I am afraid for you! I don't want my work for you to have been wasted! I am afraid of you, lest somehow I have labored toward you in vain. I am afraid of you, lest by any means I have bestowed labor upon you in vain. I am alarmed [about you], lest I have labored among and over you to no purpose and in vain. I am afraid for you, [i.e., for your spiritual safety], that possibly I may have spent a lot of effort on your behalf for nothing. fear for you, lest I have bestowed labor upon you in vain. I am in fear of you, that I may have been working for you to no purpose. you make me apprehensive, that the labour I have bestowed upon you will be all in vain. I am afraid of you, lest indeed I have laboured in vain as to you. I begin to be afraid that perhaps the labor I spent on you was wasted. Brethren, I beseech you, be ye as I am; for I also am as ye were: ye have not injured me at all. I am afraid for you, lest I have bestowed labour upon you in vain. I am afraid of you, lest I have been wearied for you in vain. I am afraid for you, lest I have bestowed upon you labor in vain. I am afraid [for] you, lest perhaps I have labored for you in vain! I fear for you, lest somehow I have labored among you in vain. I am in fear of you, lest I have bestowed on you labour in vain. Why, you make me afraid I may have spent my labour on you for nothing! I am alarmed about you for fear lest I may have bestowed labor on you to no purpose. I fear for you that my work for you may have been in vain. I am afraid for you, that I might have wasted my labor for you. I fear for you, lest I may have bestowed upon you labor in vain. I am afraid of you, lest I have expended labor on you in vain. I am afraid of you - lest by any means, in vain, I should have toiled for you! I am afraid for you, lest haply I have bestowed on you labour in vain. You make me fear that the labor which I have spent on you may have been wasted. I am afraid of you, lest I have bestowed upon you labor in vain. I am alarmed about you, and am afraid that I have perhaps bestowed labour upon you to no purpose. I am beginning to fear that I have bestowed my labors on you for nothing. 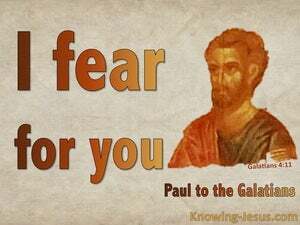 I am afraid of you, lest by any means I have toiled for you in vain. 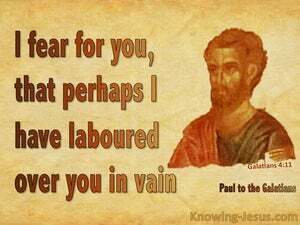 so that I am afraid for you, least I have indeed bestowed upon you labour in vain. I am afraid of you, lest in vain I did labour toward you.